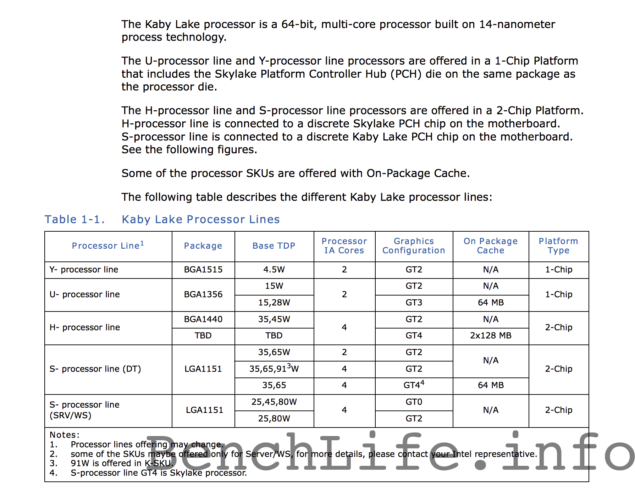 Intel is going to launch their Skylake-Refresh platform codenamed Kaby Lake in 2H of 2016 as reported in a slide by Benchlife. 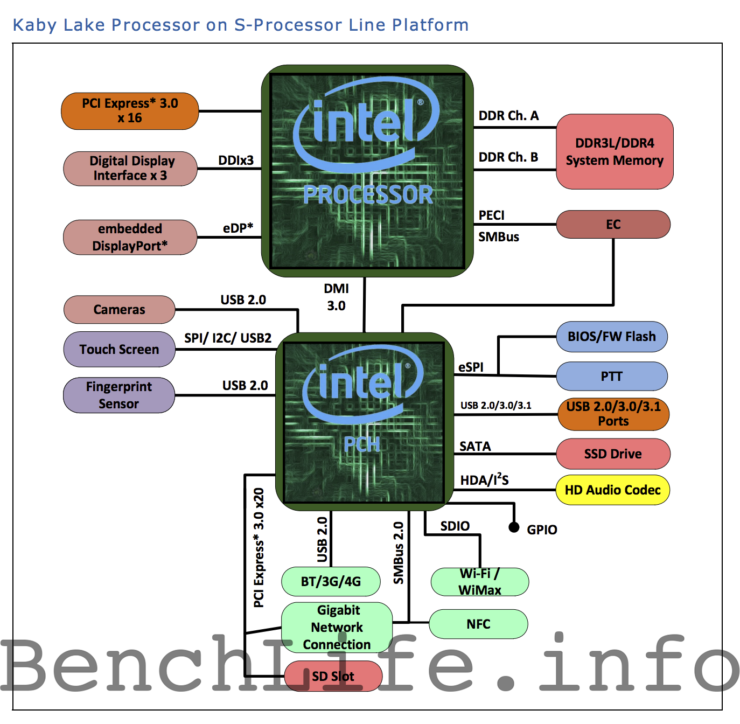 The Kaby Lake platform will be similar to Skylake platform that launches this year and will act as a platform refresher while Intel’s 10nm node matures and arrives the same year on mobility devices in the Cannonlake lineup of processors. Just like the 14nm based Broadwell and the upcoming Skylake, Kaby Lake will be available in several variants. The desktop Kaby Lake-S series will feature unlocked and locked processors along wide server and workstation parts. There would also be Kaby Lake-H, Kaby Lake-U and Kaby Lake-Y series powering a range of devices from high-end laptops to power efficient mobility devices. While Broadwell makes use of a 14nm process, much of its architecture design is carried over from Haswell that came before it hence a new socket is required to fully support the new processors. Skylake with its new CPU/GPU architecture will feature better IPC and graphics performance while keeping the power consumption lower due to the 14nm process node which is designed by Intel inside their own Fabrication plants. This news might sound a bit odd but it seems like Intel is actually going ahead with this roadmap and delaying their 10nm process based Cannonlake processors. It is highly likely that we will see Cannonlake in some form around Q4 2016 in U-series and Y-Series lineup but we cannot expect anything more until then on the 10nm front. This aligns with the previous roadmap we got to see a few months back which also stated a similar date for Cannonlake and Skylake-Refresh platform launch. As far as the processors are concerned, the Kaby Lake processor lineup will feature compatibility on existing 100-Series motherboards featuring the LGA 1151 socket. 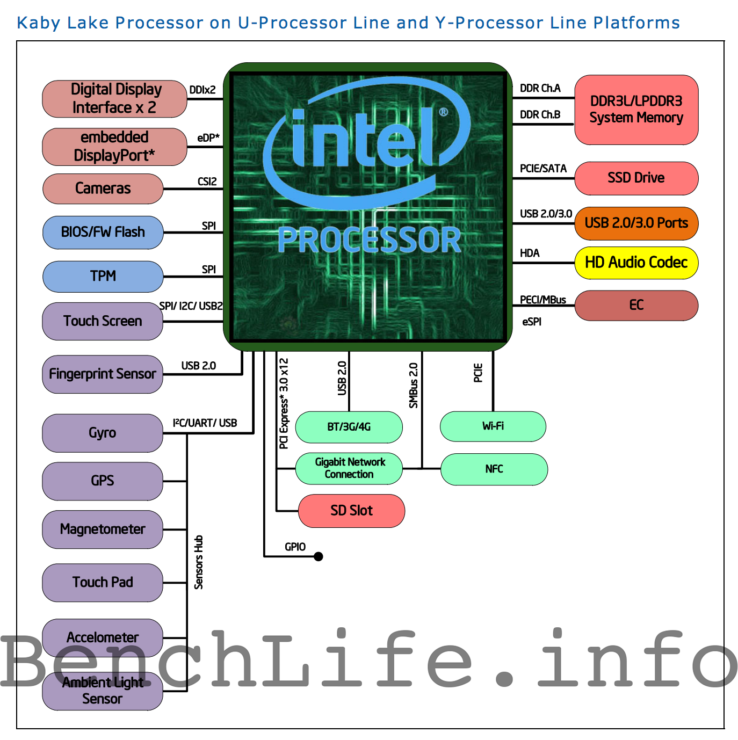 The Kaby Lake-S series processors will include several SKUs ranging from the regular GT2 based dual and quad core processors and 91W Quad Core K-Series chips which will feature fully unlocked multiplier for overclocking enthusiasts. There would also be 35W and 65W quad core processors featuring GT4 graphics with 64 MB L4 cache but these chips will be part of the Skylake-S family but will launch later. The rest of the lineup is the WS (Workstation) and server parts which include quad core 80/54/25W processors with no integrated graphics chips and 25-80W GT2 powered Quad Cores. These chips will be compatible with the 100-series chips and will feature DDR4 and DDR3L memory support. The Kaby Lake H-Series will be featured on the BGA1440 package with TDPs ranging from 45-35W. The H-Series will consist of Quad Core variants only with GT2 graphics while the PCH will be featured on the motherboard of the main device. Intel will also launch a high-end model in the H-Series lineup which will feature a TDP that is higher than 45W (TBD) but fuse faster GT4 graphics. This chip will accommodate dual eDRAM packages of size 128 MB. This will be the fastest graphics processor Intel will launch due to its 256 MB L4 cache that will power the next generation iGPU from Intel. The Kaby Lake-U Series will be feature on the BGA1356 package and have TDPs ranging from 15W up to 28W. The processors will feature two CPU cores and have a choice of GT2 and GT3 graphics core. These SOC chips will have the Kaby Lake PCH integrated on the main processor die itself. The GT2 chips will have no eDRAM but the GT3 chips will feature 64 MB L4 cache to deliver higher bandwidth to the integrated graphics core. The Kaby Lake-Y series is what we will be getting in the first round on the BGA1515 package. These chips will feature a TDP all the way down to 4.5W which is what we currently get on Core M series CPUs. The Y-Series processors will come in dual core models with GT2 graphics chips that doesn’t accommodate any eDRAM cache and will feature a full SOC design.